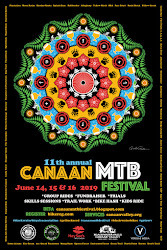 Scott Wootten of Adventure Seen put together this little ditty that captures the Moon Rocks and the sweet loamy riding of Canaan. Last year WooBear provided the entertainment at the VIP Party and raffle. He showed some of his own bike movies and ones from around the globe. It was really great night and big raffle with proceeds going to the Tucker County Trails(TCT). This year, Scott will be at the party again and be riding during the day and flying his drone helicopter getting footy of Blackwater Falls.